The new products will officially be available on the MFT online store on October 4th at 10:00 pm EST (= Europe: October 5th at 4:00 am CET). What a wonderful sentiment set! I love the font! 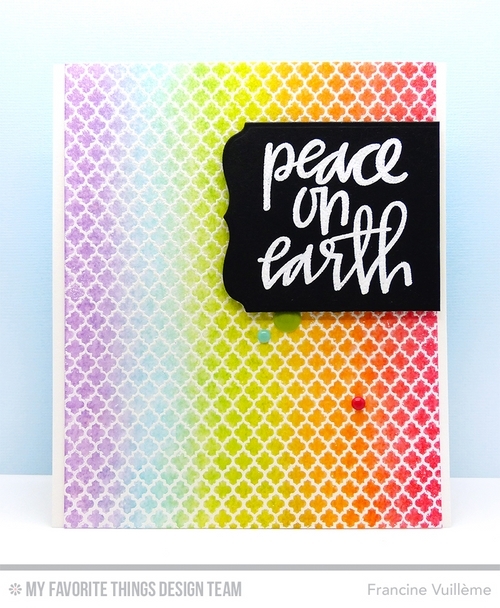 The Moroccan Lattice cling stamp is perfect to create a sponged background. Of course… I chose rainbow colors! Ha ha! I first heat embossed the Moroccan Lattice Background with white embossing powder. I then sponged the panel with MFT dye inks: Grape Jelly, Blu Raspberry, Field Day, Sour Apple, Lemon Drop, Orange Fizz and Wild Cherry. I fixed the background on a top-folded card base made from Sweet Tooth cardstock. I die cut a black label from Blueprints 13 Die-namics and I heat embossed the sentiment with white embossing powder. The “Peace on Earth” sentiment is from the Hand-lettered Christmas set. To finish off my card, I fixed the sentiment to the card base with foam pads and I added three enamel dots. Francine, This is so pretty! 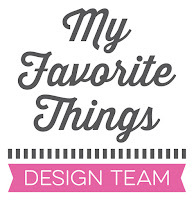 I love the white embossed stencil and the non-traditional Christmas colors! I need to step out and try these colors. They create such a WOW factor! Beautiful use of the Moroccan Lattice that shows off the elegantly lettered sentiment! The rainbow effect and colors are so beautiful with this sentiment. TFS! Love your technique, I'm going to give it a try. Beautiful rainbow background, Francine! I love how your sentiment pops against all the fun colors...perfect placement and gorgeous CAS design! Francine, this is a very pretty card! I love the uniqueness of it versus the usual (but also pretty) or traditional Christmas cards. I love the affect the stencil made with the muted colors. The sentiment pops on the black cardstock. The enamel dots help to move the eye further down from the sentiment. Thanks for sharing! Wow - you achieved your goal. A beautiful card.